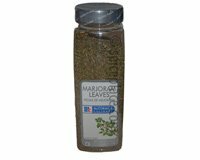 McCormick Marjoram Leaves have a look, smell, and taste similar to Oregano Leaves. It's a herb that is used in many Italian seasonings including Spaghetti, Lasagna, Italian Salad Dressings, and Pizza. Marjoram is the dried leaves and floral parts of the herb Origanum majorana. Marjoram is often used as a seasoning for lamb, pork, beef, veal, venison and other game, chicken, broiled or baked fish, shellfish, tomato dishes, vegetables, pizza, spaghetti, brown sauces, stuffings, egg dishes, breads, tossed green salads, salad dressings, soups, and oyster and clam chowder. Marjoram is an important ingredient in the Italian, French, the Middle Eastern, and Latin American cuisines. Herbed Barbecued Spare Ribs More Recipes..